What method do you use for cleaning carpets and soft furnishings? We use a method called “Hot Water Extraction”, more commonly known as the “Deep Steam Cleaning” technique. This is a deep and thorough cleaning process. It allows us to get rid of dirt, grime and tough stains and odors successfully. This technique is the recommended method by major carpet and upholstery manufacturers. From our experience over the years, we have found that this technique achieves best results when it comes to wall to wall carpets and upholstered furniture. What cleaning method do you use for area rugs? When it comes to cleaning fine carpets and oriental area rugs we offer two options. One is the “In Home” cleaning. The other is the “In Plant” cleaning. Some carpets can be cleaned in your home or office using the deep steam cleaning technique. Other carpets should undergo a wash process that is designed for fine area rugs and natural fiber carpets such as wool, silk and cotton. This in order to achieve high results and prevent any risk of damage to the carpet’s structure and color. What kind of solutions do you use? 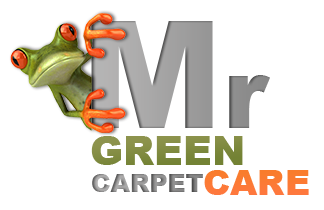 We, at Mr. Green Carpet Care use green, Eco and Health friendly products that are safe for your home, children and pets. For cleaning and repair needs, we may use other solutions in order to achieve required results. However, they will be used in plant and only upon your approval. Why should I clean my carpet, sofa and mattress? Carpets, sofas and mattresses collect dust, dirt, allergens, dust mites and other particles. Although your carpets and sofas help collect and filter the air in your home by helping maintain good indoor air quality, they must be maintained and cleaned by a professional carpet cleaning service. This in order to contain the level of pollutants and extend the life of your carpets and furniture. This is very important in case you suffer from allergies or other type of breathing issue. How often should carpets and upholstery be cleaned? This depends on a few factors. Although experts in the field recommend that carpets, sofas and mattresses should be cleaned at least once a year, there is no “one fit all answer”. When it comes to busy offices, homes with kids and pets, or for allergy sufferers we recommend a thorough cleaning once every six months. Are you able to remove spots and stains successfully? “Stains” are permanent discolorations that either added color to the fibers or striped color from the fibers. “Spots” are substances that can and should be removed successfully by professional carpet cleaners. We have a great deal of experience dealing with all kinds of spots, stains and odors. From pet urine to food and wine stains. In some cases, depending on the substance that caused the spot, our special spot treatment can remove spots and odors and improve the look of permanent stains. We move light furniture for no extra charges. Heavier pieces are left in place and we will have to clean around the item. For liability reasons we will not move valuable pieces such as china, pianos, electronics etc. How long does it take for carpets and upholstery to dry? Drying time depends on a few factors such as type of fabric, fiber, condition of the sofa or carpet, ventilation, weather, etc. Allow up to 18 hours for carpets and upholstery to dry before use. some carpets may feel damp up to 24 hours. Try to avoid walking on wet carpets as they are wet and may be slippery. Be careful when moving from wet carpets to other types of flooring. There are three ways when pricing cleaning services: per room, per square foot or per item. 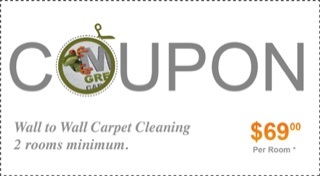 We at Mr. Green Carpet Care have a fixed price policy. When it comes to residential wall to wall carpet cleaning projects, we charge per room and limit Square Foot to a maximum size. When it comes to commercial wall to wall carpet cleaning projects, we charge per square foot. When it comes to upholstery cleaning, we charge per item and size. We offer flat rates. These rates include all costs such as cleaning products, odor and spot / stain treatment, and tax. Additional services such as Scotch guard or repairs are not included in the cleaning rates. Once a price is agreed upon via phone or email we lock it. Meaning there will be no extra or hidden charges. Yes. Our basic charge is $99. Due to costs of labor, travel, equipment, etc. we have to charge a basic charge of $99 per job.